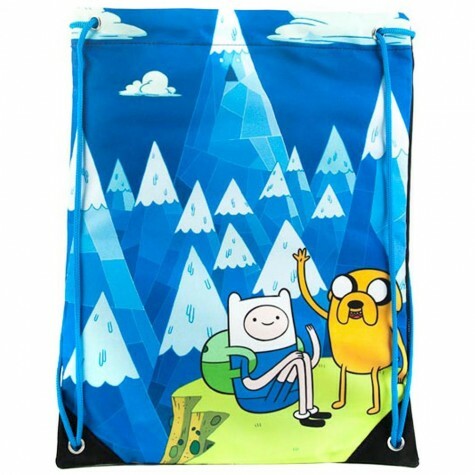 New Adventure Time Jake & Finn Blue Mountain Printed Drawstring Multi Usage Bag. A Gym Bag Made From 100% Polyester In Blue, Includes A Blue Drawstring Fastener And Small Loop For Hanging On A Coat Hook. There Is A Large Graphic Of The Jake And Finn From Adventure Time.. Features - Blue Drawstring Fastener - Coat Hook Loop - Fabric: 100% Polyester - Colour: Blue - Jake And Finn Adventure Time Motif. Jake & Finn From Adventure Time Motif.